Ask fellow campers about "Beachfront RV Park" and nearby attractions. Beachfront RV park is RIGHT ON THE OCEAN. 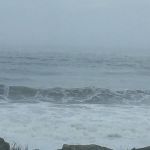 There are few (if any) rv parks where you can get closer to the ocean! Due to a unique layout, you can get a pull through - full hookup site virtually on the beach - and pull in from either direction. This means if you have a 5th wheel - rear living, you can set up so your rear bay window overlooks the ocean! Close to town, good wifi, excellent Verizon service. Be sure to go to the Hungry Clam (often) while here! We camped at Beachfront RV Park in a Fifth Wheel. Looking out at the ocean, fantastic. You are on sand for parking and such but they have paved the patio pads and have a table too. But you are at the beach. Not many places in CA or OR that you get this close to it at $38. Across the street between you and the ocean is general day use parking but it was not real busy in Sept. We were fine with it. Fun to watch the fishing boats come and go and there is a fog horn and bell that you hear at night. They give you a fire pit if you ask. We did and that was fun too. They sell wood cheap. Sandy/rocky beach but the sand is a dark color and not too appealing but the waves, really good. Hook ups good, power good, sewer line a little deep down but it works. There is a little fence between spaces. We would go back for sure.. BTW, 5th wheels like to pull in so the back is facing the ocean. It makes for a shared site to some degree. We had neighbors for only one night on both sides. The rest of the time both sides were open.. We camped at Beachfront RV Park in a Motorhome. Really good Mexican restaurant. La Flor De Mexico on Chetco Ave. Really good food and very clean too.. RV park has fire rings if you ask and sells firewood. What you get at this park is access to the beach right in front of your RV. We have been there for the past five years and the park only has the value of providing access to the beach right in front of your RV. We camped at Beachfront RV Park in a Motorhome. The thing that brings us back here is that you are camping right on the beach. In the pull thru sites motorhomes have the ocean right out the front window. Most fifth wheels park backwards so they have the view out the back. This is a public park so there are a lot of people coming and going all day. The park is closed from 10 pm to 7 am but there are no gates to keep anyone out. Being on the beach there is a lot of sand and dirt that gets tracked into the rv. The sites are very narrow, barely enough space to get the slides and awning out. They have a 14 day limit so there are no long term campers. Brookings is a nice town with several restaurants and stores for supplies. We camped at Beachfront RV Park in a Motorhome. There are many shops at the harbor. Often there are festivals at the harbor. If you're looking for a RV park that is right on the beach, thesis it. It is not fancy, in fact, it's pretty rustic. Sites are decent sized and long enough for us to park our truck in front of our fifth wheel. This park is very convenient to several eateries and the main part of Brookings. We stayed here 5 nights and would have live to stay more but they were all booked up. We camped at Beachfront RV Park in a Fifth Wheel. This Park is a strip of narrow land right at the beachfront that is shared with the public so lots of traffic and people. BUT what an awesome location! The lady that checks you in is professional and courteous! The sites are narrow but all amenities are in working order. We didn't use the restrooms as they are shared with the public as well. We camped at Beachfront RV Park in a Travel Trailer. Brookings is a typical small coast town with all the necessary conveniences. Lots of restaurants and even a newer brewery. There is a big Fred Meyer store that has just about everything you should need. As has been said by a number of other people who visit this park, you are there because of the accessibility of the beach to the park. If you have a trailer or motor home with full hookups this park is for you. If you are a tent camper or someone who uses the restrooms or showers this park will not be what you want. For us we have been there every year for the past four years and find it a very nice park but we don't use other services other than power, water, sewer and cable tv. We camped at Beachfront RV Park in a Motorhome. I used a partial hookup site that is located in the northern section of this park. All those partial hookup sites are NARROW. The most glaring deficiency during my stay was the horrible Wi-Fi service. Mind numbingly slow......constantly dropping in and out. I spoke with one of the office staff about this and they said the Port is responsible for all such matters. I was left with the very distinct impression that no one cared and no one would do anything about it. Although I did not use the outside shower (are you kidding me....it was cold outside) the shower water drain pools up right under a dumpster. It is not plumbed to any drain system. I cut short my stay due to the lousy Wi-Fi and moved across the road to another park. We camped at Beachfront RV Park in a Truck Camper. Right along the north side of this park, and fronting the Chetco river seawall is a fishing pier. There are NO fish there.......it's 99% crabbing with traps. Fishing license required......I was checked by the marine division of the Oregon State Troopers. The nearby Sporthaven cafe has the best burgers in town with outside patio style dining......totally casual. The only reason to stay here is the location - almost right on the beach with the marina on the other side. Everything else is lousy - restrooms (shared with the day use public) are always covered in sand. The laundry room (which we tried to use) was also a sandy mess. The sites are adequate but not all that large. Ours fit our motorhome nicely and we didn't have neighbors most of the time so it was fine. If you don't need to use such things, it's fine. The power was good and we didn't have any issues with the sewer although the hookup was a bit strange. Frankly, the boondocking areas have the best view and can watch the boats come and go but you pay $32 for just that. The park is way over priced. However, it is the only place where you can listen to the waves lull you to sleep. Oh, the firepit issue.. We got a LONG list of rules and one was on the kind of firepit you could bring (off ground, sides and a solid lid) Which we didn't have so we had them bring one of theirs. Simply a ring thrown on the ground. Really? 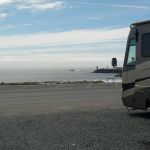 We camped at Beachfront RV Park in a Motorhome. Visit Pancake Matties... pretty good breakfast. Nice thing about this CG is that it is beachfront - look right out your window at the ocean and port facilities. The negatives - gravel, poorly maintained facilities, picnic tables falling apart, etc. We stayed for one night and expected the rate would reflect a public facility owned by the port of Brookings. Rate was excessively high for the quality of the site. We will not return. We camped at Beachfront RV Park in a Motorhome. The real value to this park has to be the accessibility to the beach. We have stayed there for the past three years so we can enjoy the beach front. While we are in a motorhome and do not need the other facilities the stay is quite nice. However if we needed to use the bathrooms or showers I'm not sure I would be willing to stay there. It's hard to beat the accessibility of the beach and the placement of your camp site. The park could be an easy ten if they had reasonably clean and serviceable restrooms. We camped at Beachfront RV Park in a Motorhome. You stay at Brookings Beachfront RV for the Ocean nothing else needs to be said. I love this place!! The only thing that would it better is if there were nice clean restrooms just for the RV park. make this place. The beach is steps away and very dog friendly!! We camped at Beachfront RV Park in a Travel Trailer. Park is right on a small section of beach. Sites are very narrow, & our first assigned site we asked for fewest or no trees, they gave us one of the bigger small trees in the park, situated so we had no room for extending the slide. Sewer hookups are not all the same size, most are too high and many are 45 degree angled. They use portable fire rings so you have to get it delivered to your site, hence, most sites have charred remains of fires right in the middle of them. Gravel sites, most with a concrete patio, price reflects a back-in FHU. Pull thru's are $51. Bath/showers are beat up, holes in the walls, terrible floor drainage, and the showers are pay-showers. We camped at Beachfront RV Park in a Motorhome. 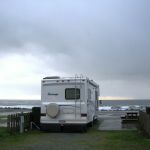 While this RV park is nothing special, the ambiance and view of the ocean is priceless. You are literally parked right on the beach. We watched whales every day. A new manager this year made our visit perfect. Gone are the bad attitudes we experienced in previous years. They are also in the process of upgrading the park which will add to its appeal. The bathrooms are public which makes them uncomfortable. OK cable and weak WiFi. We love it here and will gladly pay the premium price for the beauty and serenity. We camped at Beachfront RV Park in a Motorhome. Right along the north side of this park, and fronting the Chetco river seawall is a fishing pier. There are NO fish there.......it's 99% crabbing with traps. Fishing license required......I was checked by the marine division of the Oregon State Troopers. The nearby Sporthaven cafe has the best burgers in town with outside patio style dining......totally casual. Sebastian's Restaurant across the street has very good seafood. Make a reservation if it is on the weekend. Azalea Park in the spring is just beautiful. Fely's Cafe is gone. We will miss the on-site burgers. Zola's Pizzeria, a little way down the harbor, has excellent pizza, with fresh herbs, although $19 for a 12" pizza is pretty steep. 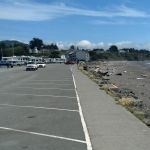 Are you affiliated with Beachfront RV Park ?